Crawl spaces tend to be unfinished portions of your house, with dirt floors and inadequate ventilation, the perfect environment for mold to flourish. With often less use than a basement, or even an attic, moisture problems often go unnoticed until it is too late. 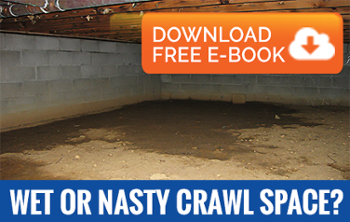 As with crawl spaces, basements are prone to moisture retention and mold growth. Basements rarely have sufficient ventilation systems, allowing moisture to build up and create that damp, wet environment perfect for mold growth. Our technicians have the tools and the expertise to assess the needs of your structure and to design a plan that meets your objectives and your budget. Closed or encapsulated crawl spaces significantly outperform vented crawl spaces when it comes to controlling moisture. Building science has improved over the last 30 years and the adverse health effects caused by mold are now better understood. What was considered adequate 30 years ago could be putting your family at risk today. In a standard crawl space over 40% of the air you breathe originates in the crawl space, it rises through the structure and vents out the attic. This is called the stack effect and was part of building design, back before they fully understood the hazards of mold exposure. The stack effect also transfers high humidity levels, originating in the crawl space throughout the house. This can cause mold issues throughout the house, warp hardwoods and force you to run the AC more often. Even though encapsulated crawl spaces are considered an improvement over standard vented crawlspaces, not every crawlspace needs to be encapsulated. If you do not have a mold problem or high humidity inside your home, we will not recommend encapsulation. Underlying causes of excess moisture. 1) Uncovered dirt. Dirt easily transmits humidity into the air, even dirt that appears dry still contains enough moisture to cause a humidity problem in your crawlspace. At the very least, exposed dirt should be covered with plastic. This is probably the single most important thing you can do to prevent, or slow, mold growth in your crawl space or home. 2) Improper drainage on the outside of your building. Grading needs to be designed to carry the moisture down and away from your home. Gutters need to be working properly and have downspout extenders in some cases. You want to get as much water as possible away from your house. 3) Blocked vents. Although encapsulated crawlspaces do not use natural ventilation and vents are purposely blocked. Until your crawlspace is encapsulated, you want to ensure that you have as much airflow as possible. Clear your vents. These steps will significantly help to reduce moisture levels and prevent or slow mold growth. However, sometimes these steps are not enough and an encapsulation is necessary. We would be glad to come out and assess your crawl space. We will be looking for mold, signs of moisture and water intrusion. We are a full service company, we can remediate the mold as well as encapsulate. If encapsulation is necessary, we would love to work with you and design a system that meets your objectives and your budget.